CIC is planning some serious investment in the One Belt, One Road initiative. CIC’s direct investments have been, and via Silk Road projects will continue to be, diversified across sectors and countries. That appears to work well: For example, CIC’s investment in Thames Water in the UK became profitable after 2012, and its stakes in U.S. energy company AES Corporation has also provided healthy returns. Many Chinese companies also have long experience building up infrastructure in Africa and other regions, generating profits for successfully bidding firms. Within the Silk Road, investments will be made in 65 countries and in infrastructure sectors such as road, railways, and power, providing a diverse array of projects. CIC’s investment in this area will be boosted by participation from other funding bodies, such as the Asia Infrastructure Investment Bank, the Silk Road fund, and the New Development Bank. Direct investment in less developed countries will help to build up infrastructure, while investment in developed countries will help to secure technology and other desirables. 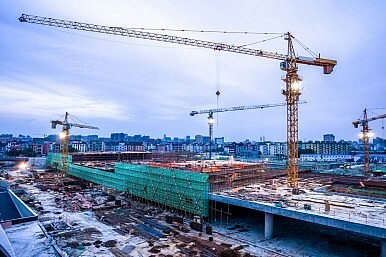 Already, OBOR projects have accounted for more than 40 percent of overseas construction projects in the first half of this year, with returns to be realized over a period of ten or more years. Based on the success of previous direct investment deals, it appears reasonable to expect that CIC’s direct investment in OBOR projects will also prove lucrative. At the same time, risks must be tightly anticipated and controlled in order to secure the benefits of overseas direct investment for China’s sovereign wealth fund. Political as well as strategic risk present serious challenges to risk assessment, which the CIC has recently striven to improve. Political risk can present a problem where political leaders or groups arise that oppose the aims of the CIC and OBOR, while strategic risk can occur where planned direct investment projects are not successful as anticipated. Infrastructure projects may not pay off if markets are scant, for example. Further, a relative lack of transparency on the part of the CIC in terms of individual project investment and disaggregated profit information makes it difficult to truly understand the risks and rewards of investment at the project level. At this point, the potential for OBOR appears to be wide open, and there has been very little negative assessment of the initiative. Given China’s ability to carry out infrastructure projects more cheaply and more quickly than its Western counterparts can, CIC’s investment in OBOR seems like a sensible endeavor. Given the long-term nature of these investments, however, this will have to be revisited years down the line. Asia is the primary beneficiary of China's global buying spree, even as Beijing tries to stem the outflow of funds.